The Universal Church has been expanding throughout the countries in North America. Recently, Mexico inaugurated another cathedral. The Church’s main goal has been to save souls, help those who suffer and lead them to a better life, away from depression and misery. The inauguration took place on November 13 in the borough of Iztapalapa, one of the Federal Districts of Mexico City. This area is considered one of the most worrisome in the social and political map of the country, with high levels of violence and misery that afflicts the families living there. About 3,000 people were present at the inaugural meeting. The main hall, which has 1,200 seats and the auditorium, which can accommodate another 300 people, were at their maximum occupancy, and there was a large crowd gathered outside as well. The new temple in Iztapalapa also offers rooms for the Children’s Bible Center (CBC), cribs and the Godllywood groups. People used this opportunity to cry out for help and come even closer to God. Among the local population that attends the Church, there are already testimonies of people who broke free from addictions and bad habits. 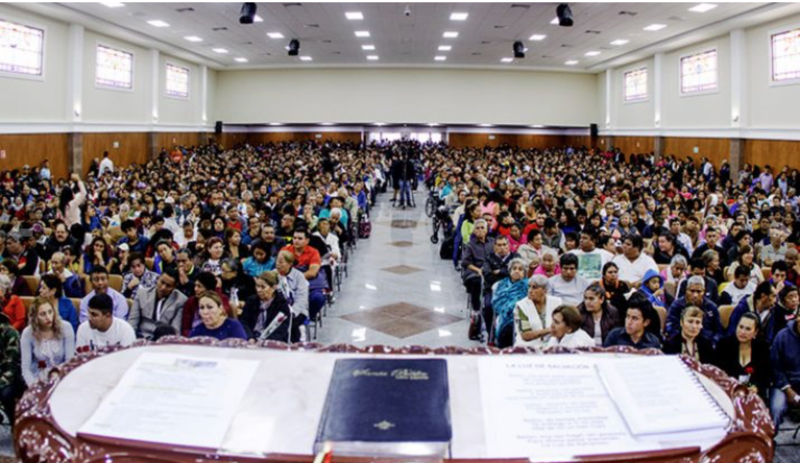 Based on this biblical passage, Bishop Paulo Roberto, who is responsible for the Universal’s evangelistic work in Mexico, led the inaugural meeting. “To be successful in every aspect of your life, the secret is obedience to the Word of God. If you want a change in your life, you need to follow the commandments of God. They are written in the Bible, because it is much more than a book, it is the manual of life, which should be followed,” he said. Maria Esther Figueiroa and her husband Patricio Cruz were the first to walk onto the altar of the new cathedral in Iztapalapa and share how their lives have been transformed since they came to the Universal Church. “Our lives were full of arguments, drunkenness and aggression. My wife argued with me because I came home drunk, was rude and irresponsible. She was right. We never had enough money and there were many worries. My wife had to look through trashcans to find food for her and the kids to eat. This was a sad and humiliating situation. Instead of moving forward in life, we just kept backsliding,” said Patricio. Changes began to happen when Maria Esther arrived at the Church and then asked her husband to join her. “I was resistant, but God convinced me. I turned away from the addictions, we changed our character and prosperity came. Today we have a house, a car and three properties. Our life began to move forward. God exists and, when we are faithful, He changes our lives,” he said.